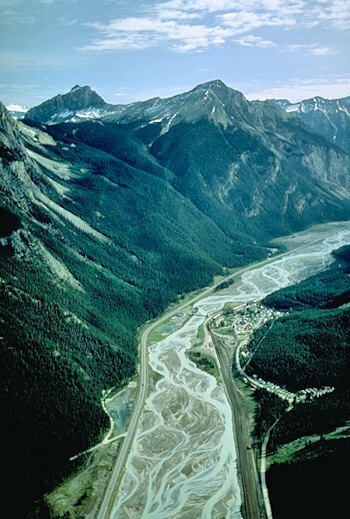 Field, British Columbia, is a small community of approximately 300 people situated on the banks of the Kicking Horse River, within Yoho National Park. Field is is located on the Trans-Canada Highway 27 km (17 mi) west of Lake Louise and a scenic 2 ½ hour drive from Calgary, Alberta. Field was a railroad town that started as a railway construction camp in 1884 and reached its heyday at the turn of the 20th Century. It was at this time in history that mountaineers, miners, railway workers, scientists and artists congregated using Field as their base of operation. The building of Mount Stephen House in Field in the year 1886 was the CPR’s first mountain hotel drawing visitors from around the globe. In 1918, Mount Stephen House was sold to the YMCA and was a hostel until 1953. Today the Trans Canada Highway is Field’s main transportation link. This small community serves as the Information Centre for Yoho National Park where spectacular Rocky Mountain scenery is all around. Field provides basic services for tourists. Natural Bridge — a natural bridge carved through solid rock by the Kicking Horse River. Spiral Tunnels — a mazing railway feat! Tunnels bored through Mount Ogden (lower Spiral Tunnel) and Cathedral Mountain (upper Spiral Tunnel).